Going old school with this box break. I received this box as a birthday present (I'm told it came from a flea market) and there was one pack missing and the box itself was wrapped in packaging tape. One thing I found very interesting about this box was the fact that there were four different wrappers inside, instead of just one. Now that's something you don't see with boxes of cards nowadays. Since this break was just for fun, I'm not even going to bother counting anything. I just want to take a look at the different cards that came out of the box. The design is fairly simple, which is a good thing in this case. I really like the red top and bottom borders on the white background. The horizontal blue and red strips are a nice touch, as they keep the left and right sides of the card from seeming empty. 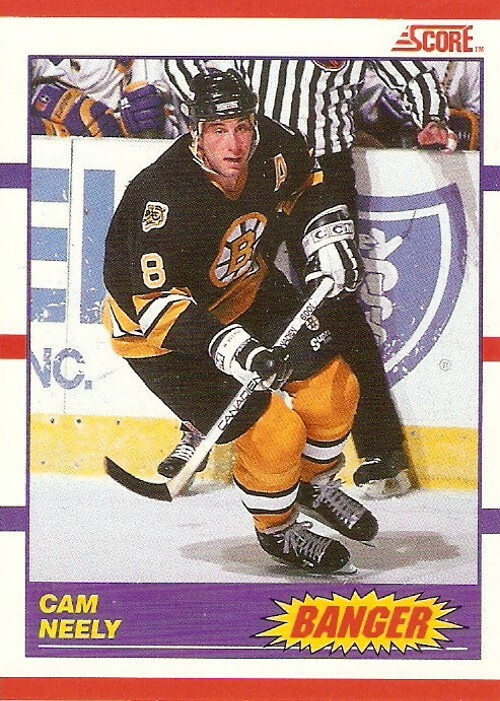 This set has a ton of subsets, everything from a set highlighting the HOF inductees from 1990 to sets highlighting first and second team all-stars from the previous season. Here is some of what I pulled. This subset highlights the first round draft choices from 1990. Not much different than the base design, except for the logo in the upper left and the blue name bar on the bottom. One thing I like about this subset is that all of the photos are studio shots. This subset features the up and comers from 1990. Again the design is similar to the base. 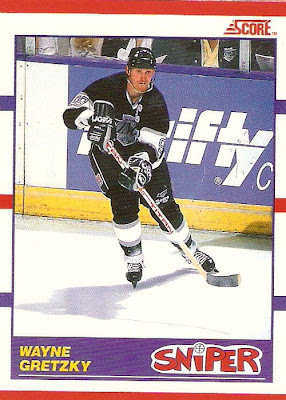 It included this Mats Sundin, Rob Blake, Olaf Kolzig, Andrew Cassels, and Kris Draper among others. This one focuses on records from the previous season. It has a similar blue name bar with yellow text again and a yellow text box with red text in the upper left corner for the subset name. This one focused on statistical leaders from the previous season. 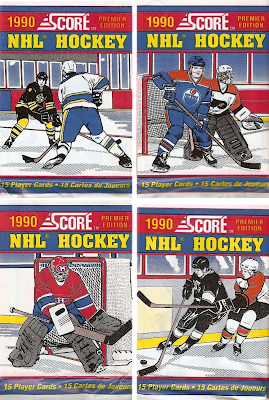 They are similar to the record setters, except for the layout of the name box and the logo in the upper left. This one's pretty self explanatory. It included the likes of Ray Borque, Al MacInnis, and others. I really like the multiple image effect, it's something most of the other subsets don't have. This one also has the multiple image effect. The only difference from the first team is the color of the logo box. Some of the players in this one included Brian Bellows and Doug Wilson among others. Pretty similar to the last two, the only difference here is the white logo box in the upper left corner. This set included the likes of Mike Modano, Rod Brind'amour, and Brad Shaw among others. The next few subsets are pretty much the same, except for the small logos in the lower right hand corder. 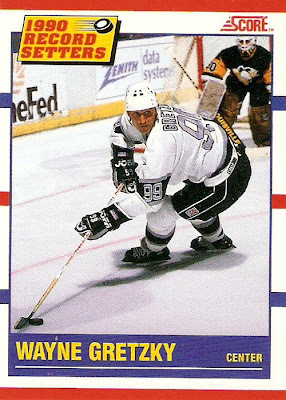 I like the no puck sign thing with the o in stopper. There was this Ranford and Patrick Roy. These are basically the same as the stopper cards, only these have the banger text. 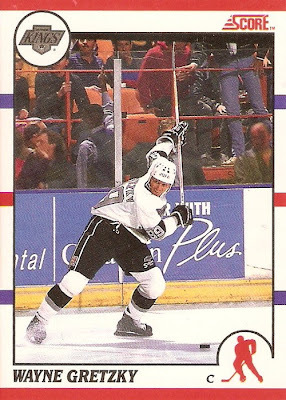 The back of this one calls Neely "The Heavy Hitter" and he's become the "prototype of the hard hitting NHL forward." 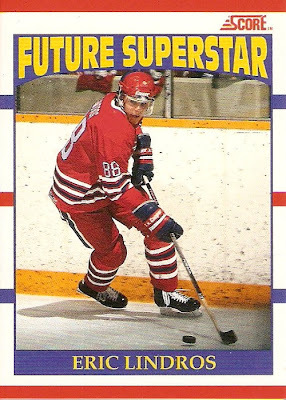 These are pretty much the same too, although I like the choice of font for Blaster more than the banger cards. 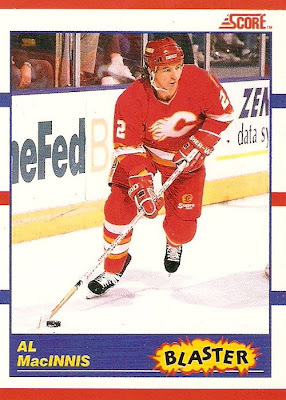 I got this MacInnis as well as the other Al with a big shot, Al Iafrate. Looks like there is a trend with all of these subsets. 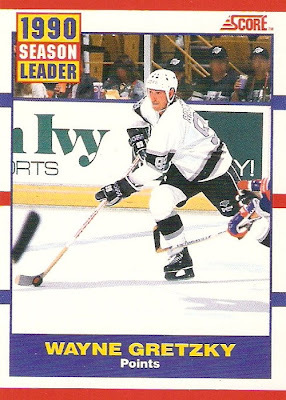 The back of this Tikkanen says "he is called the NHL's ultimate pest because of his ability to irritate highscoring forwards." This was the only one I got. Gotta love the little cross-hair for the dot on the i in sniper. 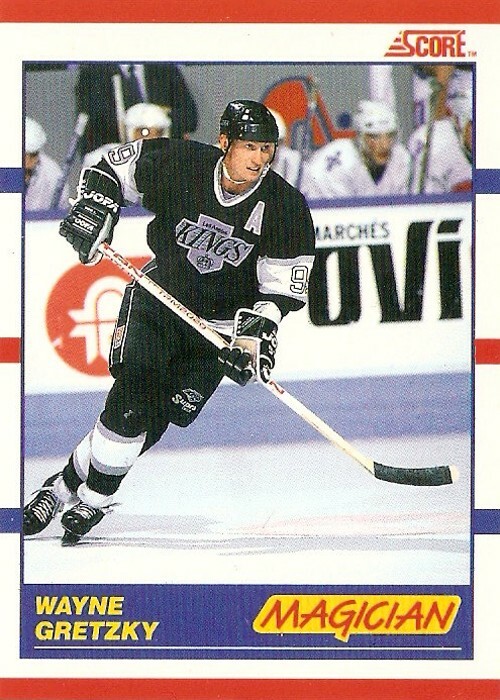 The back says, "in a season which saw Brett Hull score 72 goals and Steve Yzerman net 62, NHL goalies still feared Wayne." I like how the text for speedster looks well, speedy. 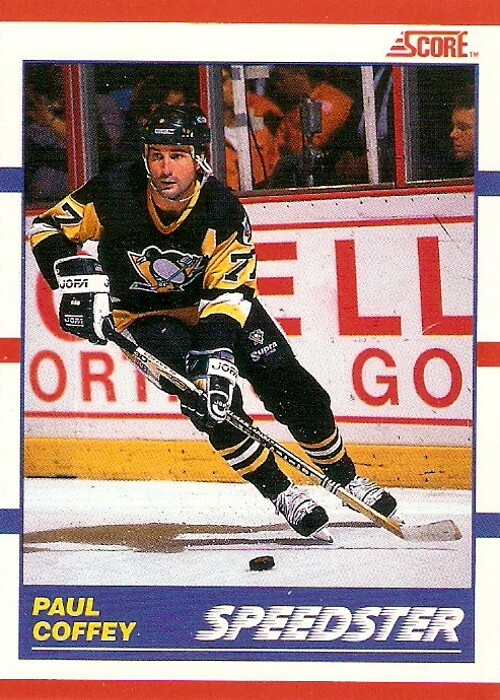 I only came away with two of these, this Paul Coffey and Mike Gartner. Actually I got four of them as I ended up with doubles of both. I think they could have done better than the red text on a yellow background on this one. 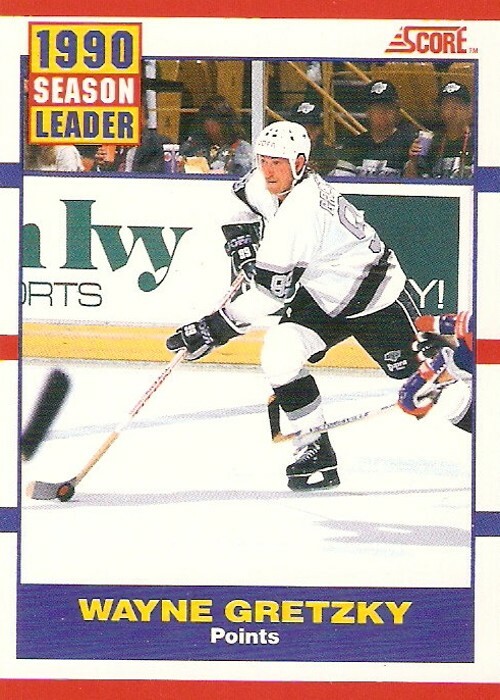 The back of the card says, "Wayne, the NHL's all-time leading scorer, is the ultimate quarterback on the ice." This was kind of a cool subset, as featured the 1990 hockey hall of fame inductees. 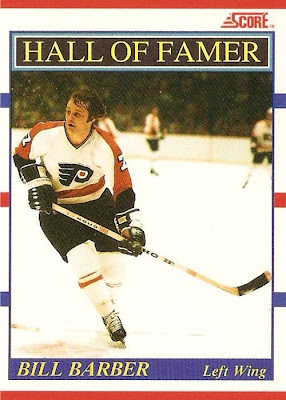 There was this Bill Barber as well as center Gil Perreault and defenseman Fern Flaman. 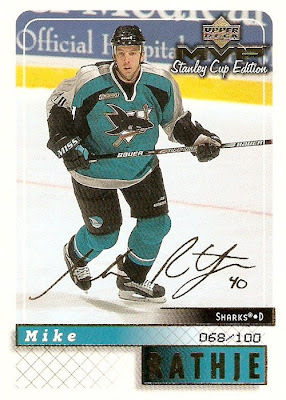 How could I forget about probably the most valuable card (at least at one time) in this entire set. 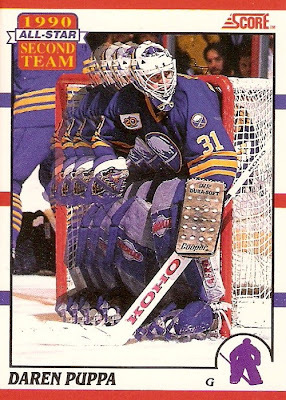 The back of this card states, "Eric is a phenom in the truest sense." I ended up with three of these. 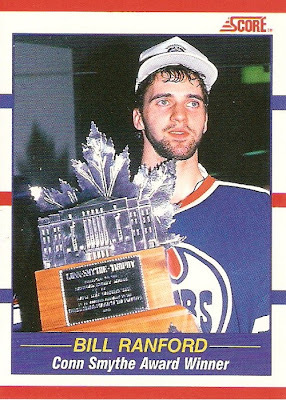 There was a card for each of the major awards from 1990, like this one featuring Bill Ranford with the Conn Smyth. Others included Roy with the Vezina and Gretzky with the Art Ross trophy. 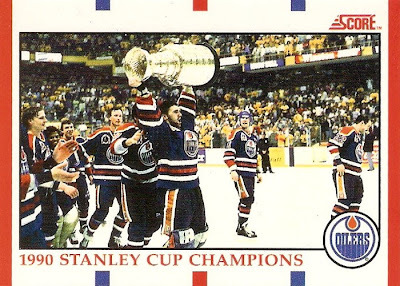 I don't know if this would really qualify as a sub set, but there were cards for the Stanley Cup champs as well as the conference champs. I believe they were the only horizontal cards in the entire set. All in all this was a pretty fun and nostalgic break. I remember getting tons of these cards back when I was a kid just getting into hockey cards and its always cool to take a look back like this. 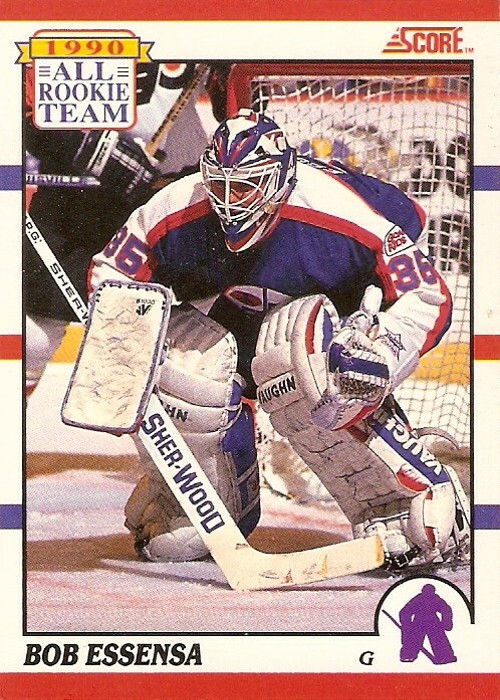 This pick is one of the more oddball cards in my collection. 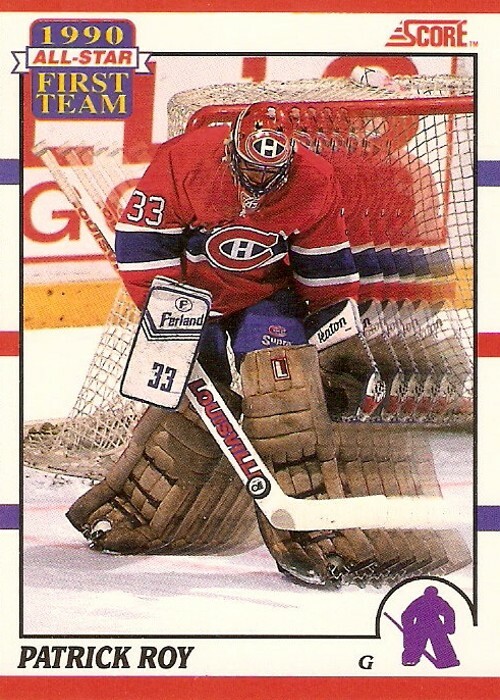 I forgot about it until sorting through some piles of cards the other day. 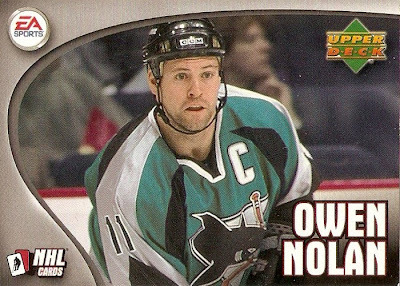 If you've ever played EA Sports' NHL 2002 then this should look familiar. 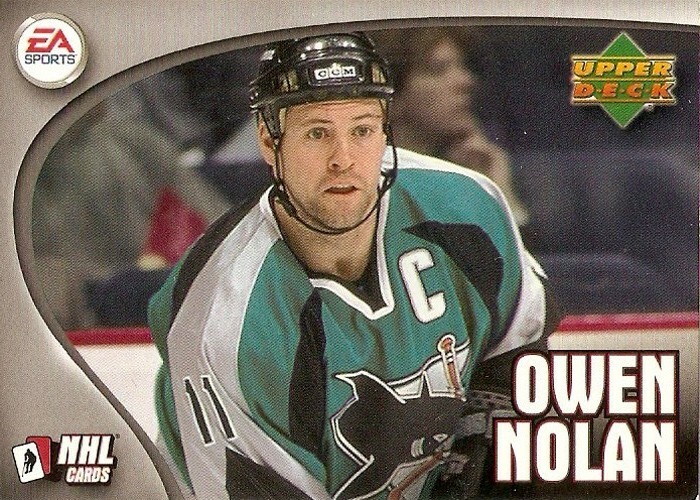 This Owen Nolan came packaged with the PC version of the game. 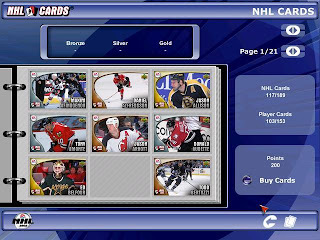 In the game, there was a set of virtual trading cards you could collect in order to get power boosts, cheat codes, and other goodies. 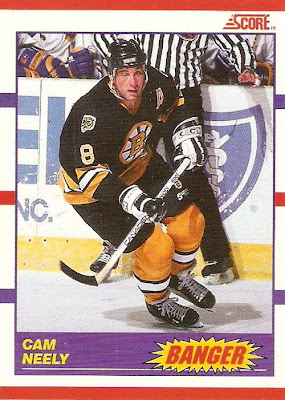 ﻿There were a total of 189 cards in the set, 153 of which were player cards. Then there were bronze, silver, and gold versions of each card. Here is a screenshot of how the cards looked in the game. 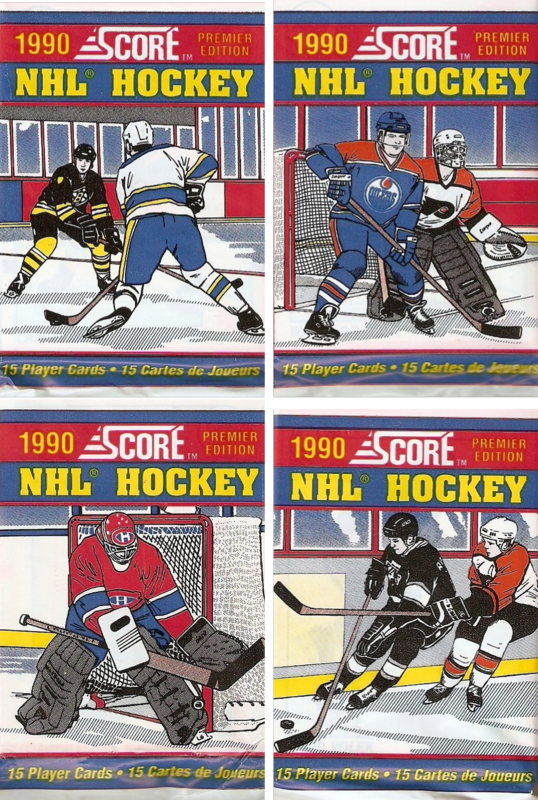 It was a really cool concept at the time and it was even better that real copies of the cards were produced and distributed with the game. Too bad they only included one with each copy of the game. 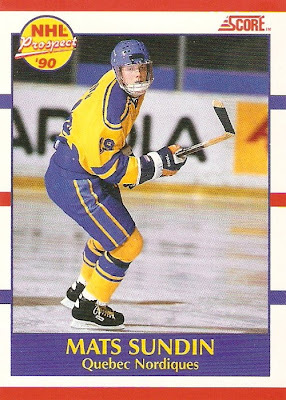 I did a quick check of ebay and only found one of these things. It was a gold version of the Mario Lemieux, and it was listed as BIN for $15. Does anyone have any of these? Have you ever seen one? I'm curious to see how many of these are out there within the hobby, because this would be a cool set to go after. I was going through some of my 5000 count boxes today and came across two more Silver Scripts that have been just sitting around forever now. One was Joe Sakic and the other was Mark Messier. These two bring the Silver Scrip collection to 18. These should be the last of the ones I have hidden here or there, as 18 would pretty much account for the one box I busted when this stuff came out. 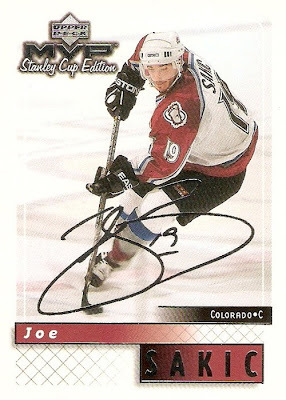 There's something up with the Sakic though, as well as a few other cards in the set I've noticed. Notice for the team name it says Colorado rather than Avalanche, like the Messier does with Canucks. Is there some oddball trademark rule with certain teams or something like that? There are a few other teams with the same thing, including Phoenix, Nashville, and Carolina. Maybe it's nothing, but I still find it interesting and odd. I was browsing ebay the other day and came across an auction for an MVP Gold Script card. It's numbered to the player's jersey number and the seller claims it's a 1/1. 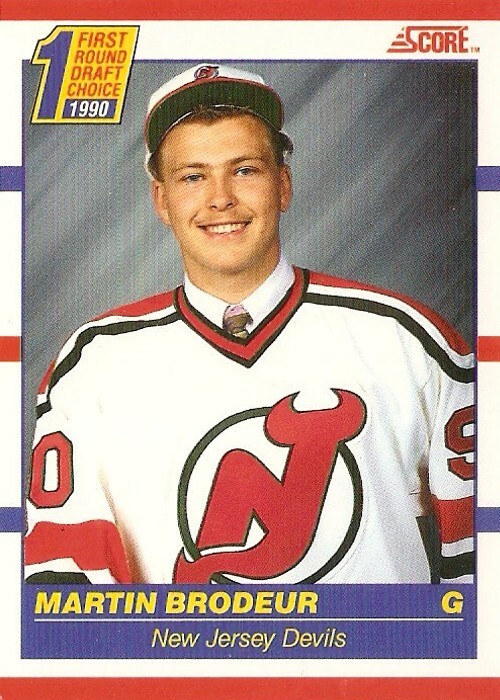 There's just one little problem with that claim, actually 99 problems, those being the other 99 of the exact same card out there. This is one of those things that just rubs me the wrong way. It's not a true 1/1 unless there's only one. I understand the novelty factor of having the card numbered to the player's jersey number, I know I would pay a little extra for any Jimmy Howard card with the number 35, but does that really make it a legitimate 1/1? I don't think so. That would be like saying a card numbered 32/100 is a 1/1 because there is only one 32 from 0-100. If the seller wants to call the card unique or something, that would be fine with me, but not 1/1. What's your opinion of a card numbered to the player's jersey being considered a 1/1? It's seems like forever since I've had an update on this set. Well, actually it's been over eight months now, so almost forever, since I landed that lot of ten Gold Scripts for basically nothing on ebay. I kind of ended up with this one on accident anyway. I happened to look at the seller's page with the Johnson Super Script and saw this Mike Rathje Gold Script listed for $1.99. Add the combined shipping savings to that and voila, another Gold Script off the list. This makes for my first pair of Super/Gold Scripts for a given player. Now I really want to track down the Rathje Silver Script and base just to see all four of them next to one another. Finally, another Super Script to add to the collection. 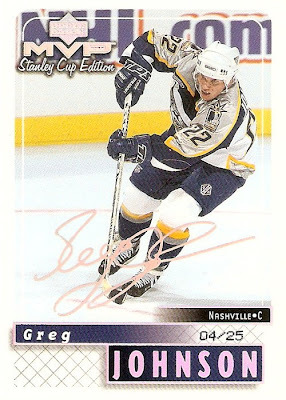 It's been a little while since I got the Korlyuk, so this Greg Johnson numbered 04/25 was a welcome addition. This one brings the Super Script total to 12. I happened to see this one on ebay for less than $5 so I had to jump on it immediately. I waited out the auction and ended up winning it with one bid for only $3.99, which is about average in terms of what I've been paying for the others lately. As with the Silver Scripts, I'm liking this set more and more with every new addition. That tells me I've found a set I'm bound to enjoy chasing for quite a while. I know it's not the most high end set in the world, but I have to think a set of 220 cards numbered to 25 is not exactly the easiest thing to complete, let alone the fact that this one is over ten years old now. Regardless of how impossible this set may seem, I'm going to continue to pursue it for as long as I can, and hopefully finish it someday in the distant future. I went to my local card shop to kill some time the other day and to maybe find some Silver Scripts in the dollar box. 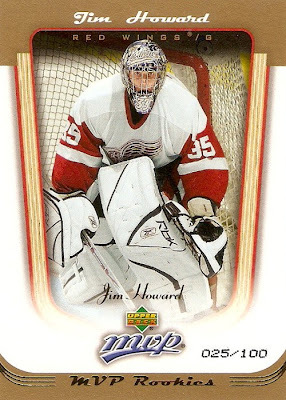 I didn't find any of those, but I did make an unexpected addition to my Jimmy Howard collection. The last time I was in there I got to talking with the owner and he was going to keep an eye out for any Howard cards that came his way. I completely forgot being so busy lately and when I walked in he said he had something I might want. Needless to say, I did want it. 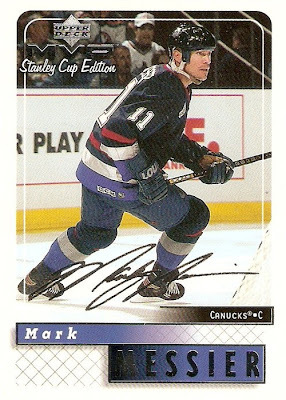 This 05-06 MVP Rookies Gold numbered 025/100 is now the lowest numbered card in my Howard collection and it brings me to eight different cards, nine total with the two Trilogy RC's. Now I'm going to be on the lookout for the Platinum version of this card, which is numbered to 25, as well as the base version to complete the rainbow. 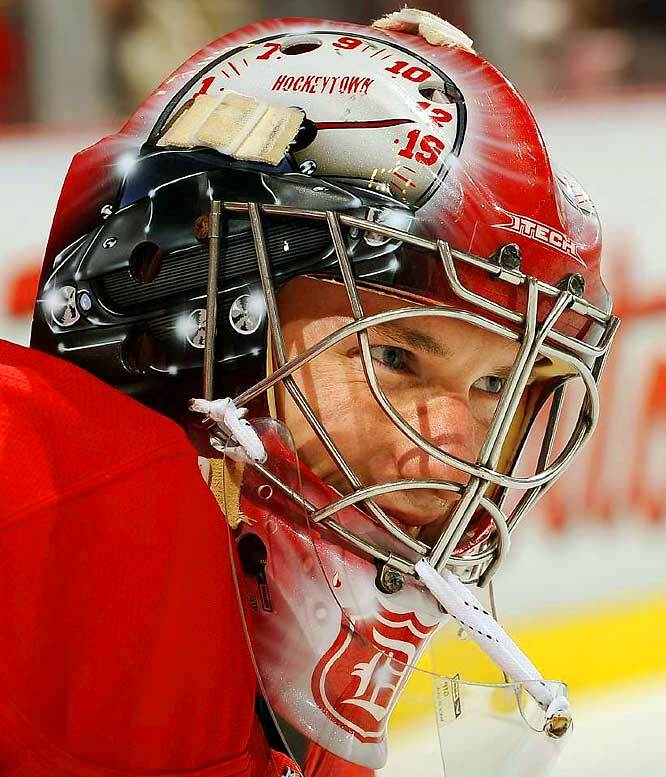 I just came across a picture of what has to be the most clever Red Wings goalie mask design and thought I would share it. 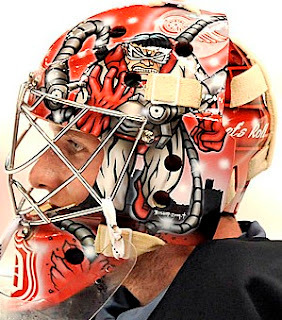 This design I'm referring to would be Jimmy's mask for the upcoming 2010-11 season, done by Ray Bishop, featuring super villain Doctor Octopus. I thought his mask from last season was the best it could get with the 1967 Shelby Mustang and a tachometer featuring the retired numbers hanging in the rafters at Joe Louis Arena. I definitely think this new design tops the old one. 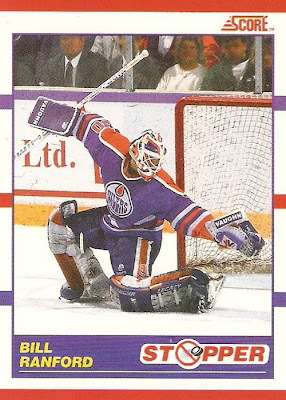 Now I just have to hope either Upper Deck or Panini will feature this mask on cards this season, as early releases like Victory and Certified feature the old Mustang design. I usually don't go this long without posting, but things have been too hectic lately with moving to a new apartment, closing in on my last few weeks of college, and a four day trip to Tennessee last week. 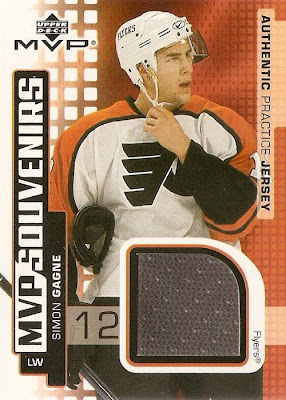 So to try and get back in the swing of things, I chose this Simon Gagne Souvenirs card from 2002-03 Upper Deck MVP. It's not just any old jersey swatch though, it's a piece of an authentic practice jersey. 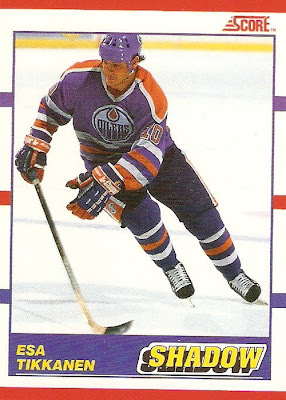 I don't know how I feel about the one hit in that box of MVP not even being a game jersey, but I guess it's better than an "event-worn" or "player-worn" jersey. It's a little out of the ordinary, and I like that. Beyond the fact that it's just a practice jersey, I actually really like the design of this set. The swatch is decently sized, the team color jersey mesh background is a nice touch and I also like the black and white "MVP Souvenirs" text going up the left side. As far as the types of swatches featured on cards, what are your thoughts on game-worn versus "even-worn" and "player-worn" swatches? I personally do not like anything other than game-worn.